Foundation... oh boy, oh boy. I won’t lie to you, foundation is a pretty complex topic, and one that often takes years for makeup artists to master. 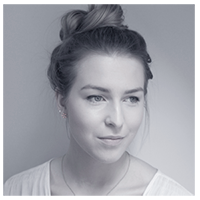 Beautiful skin can be hard to achieve - however luckily for you, you’ve only got one face to master (unless you are a makeup artist). So hopefully these tips will help you to get a handle on what you need to do. For those of you don’t already know, this post is my third installment to the Starting Off Project (better known as #theSOproject on Twitter). Personally, I never used to bother with foundation. I was lucky in that my skin was pretty fairly spot-free, so why bother? These days, however, if I’m doing anything more than a super simple eye look, I will always put on at least a little tint to my face, just to even out my skin-tone and balance my look. A foundation helps to cover spots and blemishes, redness and veins. Please remember though, if you don’t feel comfortable wearing foundation then don’t - some people can’t due to sensitive skin, and some people just don’t want to, which is fine. Sheer - My most frequently used. Barely any coverage and most frequently found in tinted moisturisers or BB creams (see explanation below). Medium - will cover a fair bit of redness and imperfections. I am more likely to wear this for a night out or special occasion as it can feel a little heavy on the skin. Something like Nars Sheer Glow or other liquid or powder foundations on the market. Full - this will cover your face so much that sometimes your skin won’t even be recognisable due to the amount of makeup caked on. I’d save this as more of a concealer for patches of acne; in my experience this coverage is most regularly found in a creme or sometimes liquid consistency. BB Cream - These are still relatively new to the market. These are usually in liquid form and usually provide sheer coverage. They also provide SPF and moisturisation, and sometimes even have anti-aging properties. This is perfect for people with very clear skin or as a base for your makeup. Tinted Moisturiser - This is again a very lightweight option in liquid form with little coverage for those who want a light base to wear by itself or with concealer where needed. They are - as the name suggests - moisturising, but can be worn by oily-skinned girls if they pick something oil-free. Liquid - This can be worn by most skintypes as there are so many variations in coverage and formula. As suggested, this is comes in liquid form but can even range between watery and fairly thick and so can be applied in a range of ways. Cream - This stuff is often found in a pan or stick (a bit like a concealer). It’s not always full-coverage but is very likely to be. I’m still experimenting with these but so far I think that their best use is concealing and highlighting/contouring. Powder - This is more often used to set foundation so that it stays in place, although it can be used by itself if you’re oily skinned. This will give you a matte look which I’m not a huge fan of, but if you absolutely hate any shine then it’s worth investigating. (Mousse) - a consistency released by Maybelline a few years ago. I haven’t tried it properly myself, but it’s not hugely popular these days and I’ve heard that it’s best suited to oily skin types. Satin - This is created with foundation that is lightly powdered and has no shine, but may have a little sheen. Luminous - This is a fairly unnatural finish that is more often used in editorial work by makeup artists, but it extremely iridescent and dewy. No powder needed here! Natural - As it suggests, as your natural skin would be. This will include a bit of a glow to make your skin look healthy. Hmmm... which would you pick? When picking a foundation it’s good to think about the categories that I have mentioned above, but also think about what your skin wants. If you’re having trouble determining your skin type then please refer to my post on Skincare. Also consider when you'll be wearing your foundation. For day to day you may want something sheer with SPF, but for night you may want fuller coverage and no SPF (or titanium dioxide) to avoid 'pale-face syndrome' when you have pictures taken of you. If I were you I would take the time to research a bit online. Read stockists’ websites and blog reviews, I often get overwhelmed with what the sales assistants tell me in store. It is also important to remember that there are some inexpensive and some bank-breaking foundations out there. Some are good and some are not - to help you a little, I’ve got a <>tried and tested<> section down below to let you know my opinions on the foundations that I have tried. So now you’re in the shop, what do you do? I would recommend matching your foundation yourself. This may take some guts as the sales assistants might have been taught to do it differently. I always match my foundation to my chest. Not to my neck (the palest place on the body as it’s sheltered from the sun by your chin) because I’ll look like a ghost, and not my face itself as I want it to blend in with the colour of the rest of my body for a natural look. 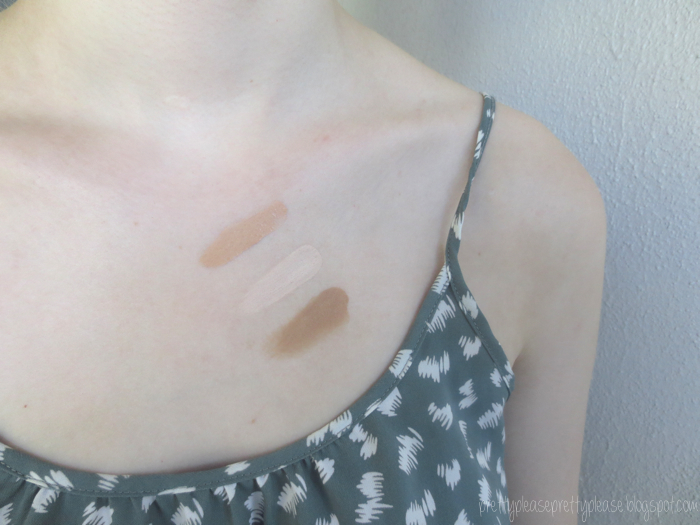 Take two or three shades of tester foundation and do a stripe of each across your chest. Pick the one you think matches best and ask the sales assistant for a tester of it. They should oblige, but if not you can offer to bring along a little tub to take a bit home in yourself (available for under a pound in places like Superdrug). A foundation is an investment and cannot be returned so you have every right to try it out! Besides, you never know how your skin may react and the lights in the shops are hardly natural! Prep: Now you’ve picked your foundation and taken it home, what do you do with it?! Firstly you’re going to want to prep your skin ready to put makeup on it. You can buy all-purpose primers, but I prefer to tone (especially important if you have oily skin) and then moisturise. Alcohol-free baby wipes are a cheap alternative to toner for prepping purposes. Moisturiser will provide a nice base for your foundation to glide onto, and will improve its longevity. I would leave your moisturiser to sink into your face while you apply your eye makeup; this is also important as it’s easier to clean up any fallout that you have from your eyeshadow so that you’re not repeating steps. Tools: When you come to putting the foundation on your face, fingers are great for anything that is liquid. However, if you want an ‘airbrushed’ look, your foundation to last even longer or are applying a powder then you’ll need some tools. Powders are applied best when they are pressed onto the face with a powder puff or powder brush, whereas creams and liquids look great when applied with a foundation or stippling brush. Really watery liquids or liquids applied to people with dry skin work best on sponges, so you don't buff the skin and potentially cause dry bits to flake off. Even when using a brush I like to smooth over my foundation with my hands afterwards to help it sink in and create a natural finish. Technique: I start applying my foundation in the centre of the face as that is where people have the most redness and will need the most coverage. You may not need as much on the rest of your face, but it’s important to blend it all the way down to the bottom of your neck, anyway. This will prevent foundation lines and will keep your face and neck colour looking uniform with the rest of your body. Look out for patches on your hairline and ears (yes, I said ears), as well. After this you may want to set your foundation with a powder across your T-zone or all over the face and neck. My weapon of choice is the Eshiko High Definition Powder as it is translucent and will suit my skin year-round. There are a range of powders on the market perfect for the job, though. 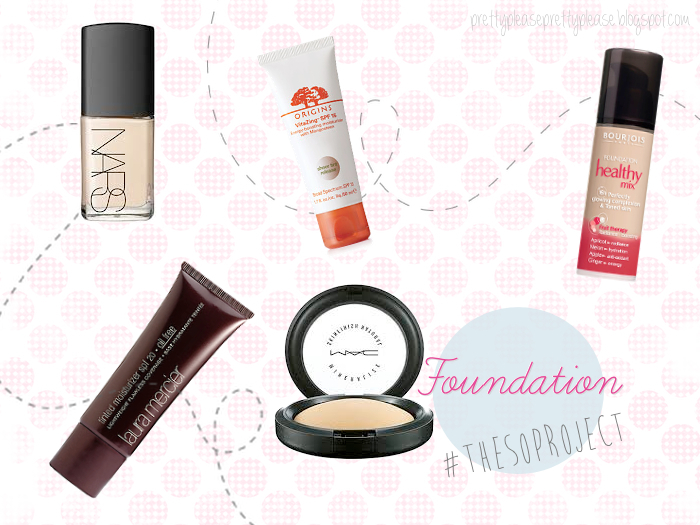 Here are a few of the foundations that I have tried for myself over the years and what I thought of them. Please note that my skin goes between being dry in the winter and more oily in the summer, I will specify which I was at the time that I used the foundation in each mini review. Bourjois Healthy Mix Foundation - This was a fantastic liquid foundation for when my skin was more dry. I found that it wore off after a full day without powder, but it was so easy to apply and a bit of a bargain. I haven’t tested this on oily skin. The coverage is probably light to medium. 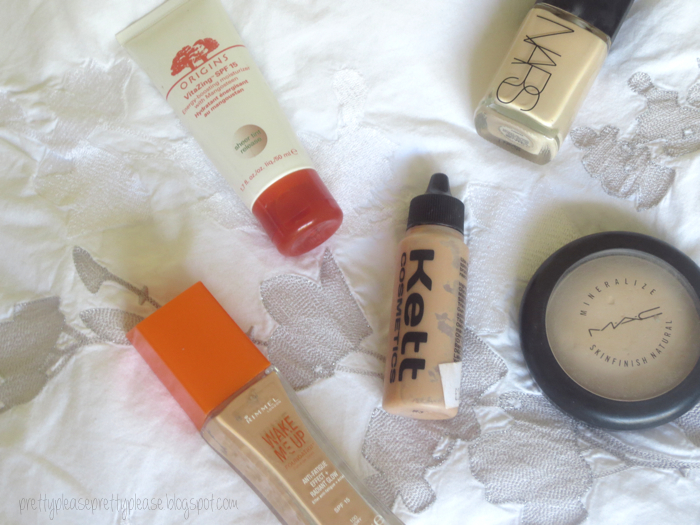 Kett Cream Foundation - This is definitely for people with oilier skin. I’m not sold on this as an all-over foundation as it’s fairly heavy coverage, but I like it as a concealer or for highlighting and contouring. Laura Mercier Oil-Free Tinted Moisturiser - This was my favourite foundation for a very long time, and although I loved it when I had dry skin I’m looking to use it now that my skin is a little more oily too, due to its lovely sheer-light coverage. Mac Mineralise Skinfinish Natural - This was my first setting powder, and although I don’t use it as much now due to its levels of titanium dioxide and talc, it’s still handy from time to time and could be used by itself as a foundation (although I found this to look a little cakey). If you do use this as a foundation apply any liquid concealers first as they will not sit on the powder. Mac Pro Longwear - Although this is a liquid foundation I found it to be quite gloopy and drying on the face. It didn’t sit nicely on my skin at all and has a medium coverage. Nars Sheer Glow - This is my all-time favourite foundation. It is liquid and medium coverage, and although it is ‘glowy’ it works perfectly on my skin whether it is dry or oily. I will always repurchase this foundation due to its gorgeous, silky texture and dewy finish. No 7 Triple Protection Tinted Moisturiser - The worst tinted moisturiser that I have tried by far. It is a thick liquid that has to be rubbed in so well to avoid dreadful foundation lines. It’s supposed to change colour to match your skintone but always applies too dark for me with barely any coverage. For a full review, please read here. Origins Vitazing - This is a little like a BB cream and it has really grown on me. It comes out as a white liquid and matches your skin tone. The coverage is very sheer but the SPF is good for my nearly-no-makeup days and the extra moisturisation makes it a good base for makeup. I currently use this with my oily skin. Rimmel Wake Me Up Foundation - This is a great, cheap alternative to Nars Sheer Glow. It has a slightly dewy finish, although is a lot sheerer in coverage but can be built up a bit. I can use this with dry or oily skin. I know that that was a long one, but there were so many tips that I wanted to include for you! As always, if you have an questions please leave them in the comments, or you can always e-mail me or tweet me! What are your best foundation tips? Love that you talked about the different finishes and tones!